Vertical and Cantilever Racking can be used to store bar, rod and panel products which are not suited to pallet racking. A central column bolted to the floor supports either single or double sided cantilever arms, which can be designed to support your individual loading requirements. 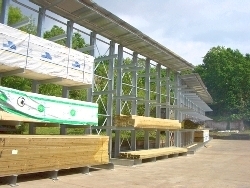 Cantilever Racks can be used in external environments when they are hot dipped galvanised, HMF can even fit weather proof backs or roofs to form semi-dry storage areas such as timber stores. Building merchants, electrical wholesalers and plumbing merchants use Vertical Racks to store trunking and piping which is easy to identify and access by hand. 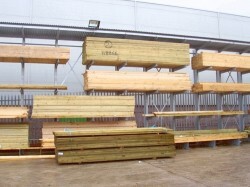 Hampshire Mezzanine Floors can design Cantilever and Vertical Racks to suit your particular application and product, ensuring maximum efficiency, economy of layout for a safer working environment.